The Dingo pack of One Tree Rocks, waiting for the rest of the pack to arrive at the rendezvous site. 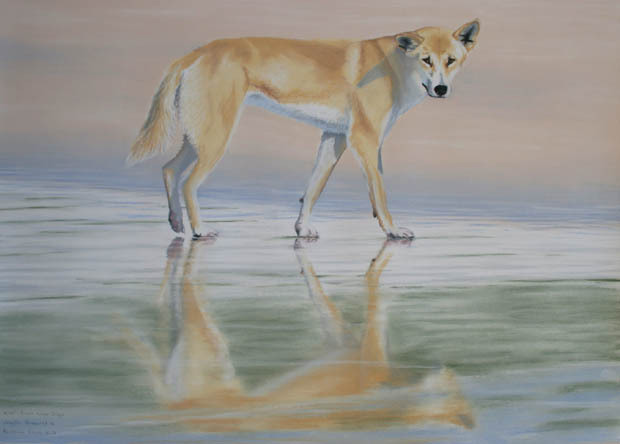 Beaut dingo paintings, they show what an awesome animal they are. I’ve just found your site. It’s great. 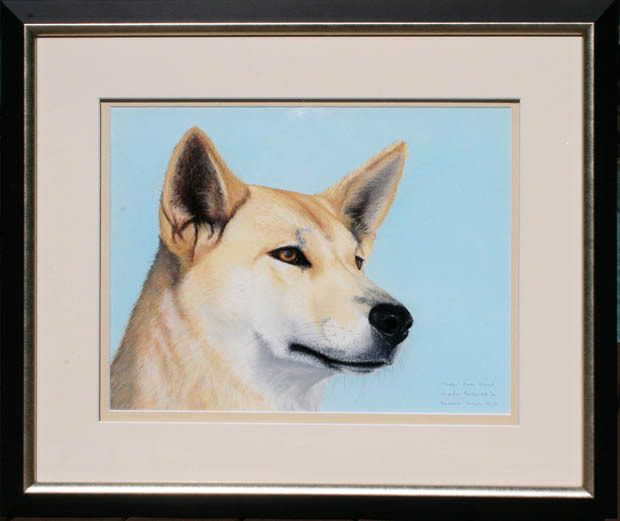 Your dingo portraits express what cant be translated into words. the look in their eyes is so realistic, it’s like they are looking right at me. I just finished watching the Australian Story about your time on Fraser Island with the dingoes. I really admire your courage and strength. It takes a very strong person to abide by “rules” and not feed the starving dingo and then standby it when he/she takes its last breath. You seem like a remarkable person and I think what you’ve done is wonderful. 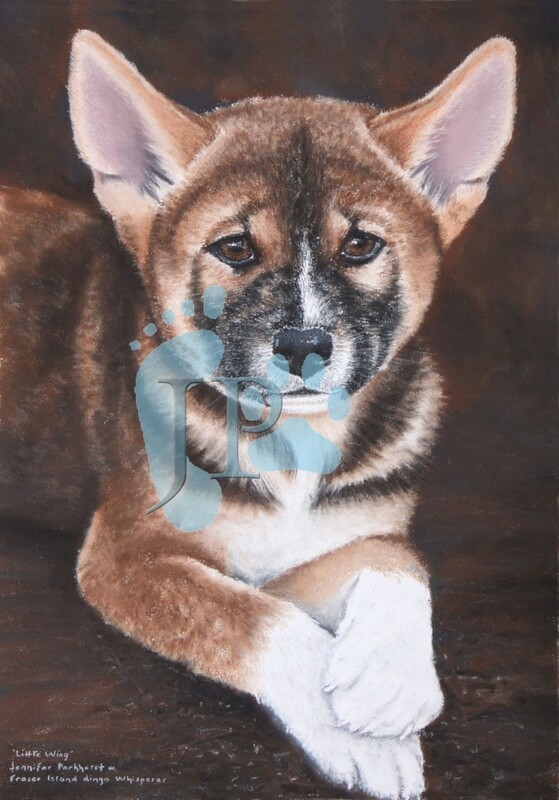 I noticed you have been asked by others if you could paint picture of their pet – would you do this? I have a border collie and if it is a possibility how much would it cost me? I’ve only just recently heard about you- from Dingo Simon. I watched the Australian Story program and like many others, want to offer you my support and utmost thanks for the wonderful things you have been doing. I’ve just started a Bachelor of Applied Science with a Wildlife Science major. 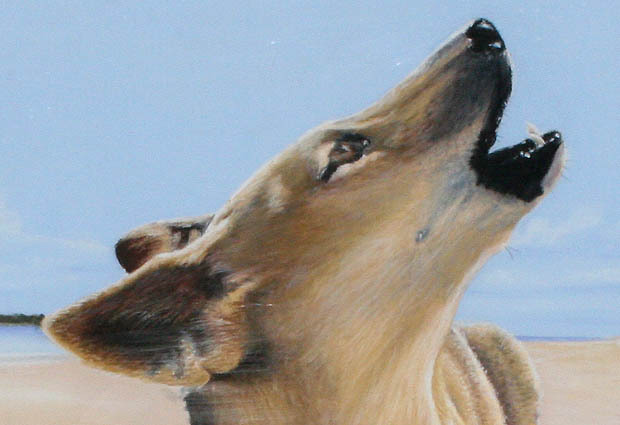 The plight of the dingo has never been such a reality to me as it is now. And that is the sad case for so many Australians- they still have this uneducated view that dingoes are pests and agressive and… well you know the deal! What saddens me also, is the knowledge that the rangers would have had to study a degree similar to what I’m now doing- they can’t tell me they choose such a degree without loving animals and wanting to contribute positively to wildlife conservation?!? What happens when they become employed by the government??!! People like you & Bob Irwin & Dingo Simon are my heroes! God Bless! you’re right. i’ve seen no evidence of these animals eating each other, despite the fact they are starving. the altrusim and self-sacrifice they display to look after each other however is incredible. 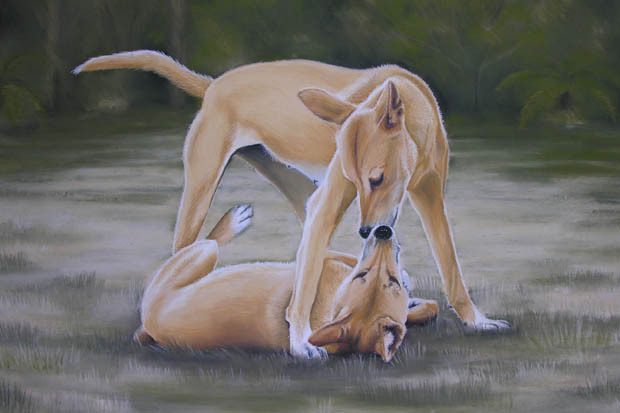 if we as the human race looked after each other, and had the same value system, as dingoes, the world would be a better place. and you brought up another good point; it is our dury to look after those who have been made dependent on us becasue of our actions. thanks for your thoughts. Hi Jennifer, ever since I saw your story on the ABC it has haunted me -I had no idea that this was going on!! It makes me so sad to see what is happening to particularly the Dingo but also the other Australian wildlife!! We are presently trying to stop further development in the Greenbank area for this and other reasons. These people in government don’t seem to have any idea regarding animals and it is all about the mighty dollar, seems to me!! 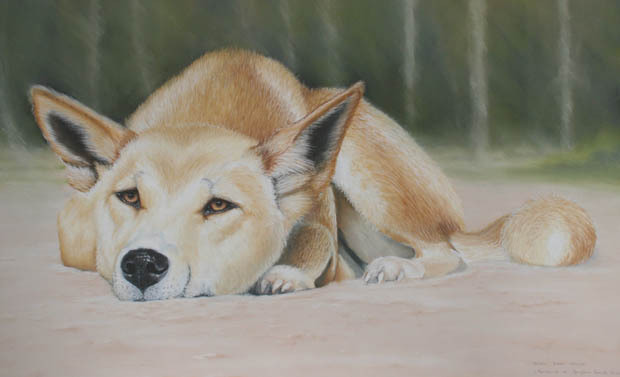 Thank you for bringing the plight of the Dingo to our attention!! You are a very special person – keep up the good work!! We just love your paintings!! What a strange world we live in!! Don’t feed a starving animal in order to protect a prospective food source?? We have been known to eat our own in order to survive and yet I saw no evidence of this amongst these “animals”.Shame on those who do nothing to keep these vulnerable animals from starving. Because we took away their food source (wild horses I believe)what are they to live on? It is our duty to look after those that we have made dependant on us by our actions, shame shame. Thank goodness for people like you and your supporters. We just saw the ABC Australian Story special on the dingos and it really touched us. 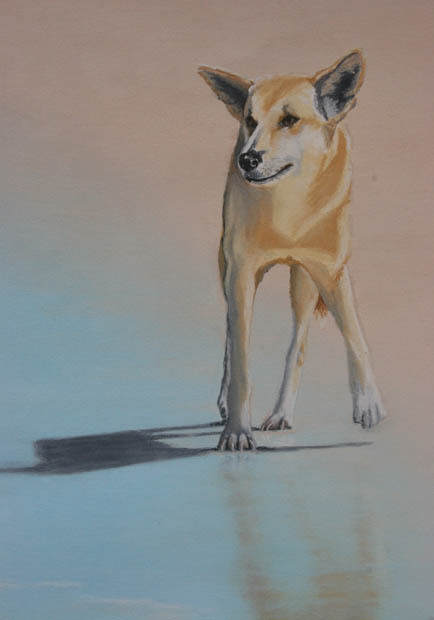 We have an 8 year old cattle dog so dingos are close to our heart. We can’t believe what Parks and Wildlife have done, typical red tape. It seems the only way out is to give control back to the local Aborigines and they will manage the dingos. Maybe we should start limiting the humans that get to visit? As we are entering the dingos domain, not the other way round. Keep up your great work and hopefully others will follow, you now have us on board for sure and we’ll spread the word. I would really like to commission two of your beautiful paintings. Look forward to hearing from you and I can let you know which two I would like and any other details you require. Thanks also for the great work you have done and continue to do. 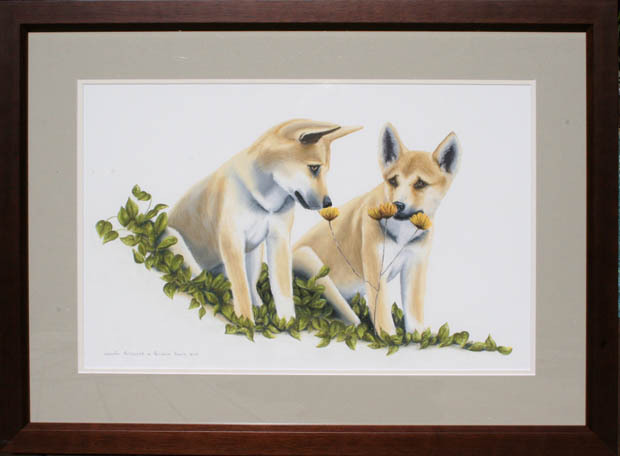 please take your camera with you to FI and take as many photos of the dingoes for us as you can. 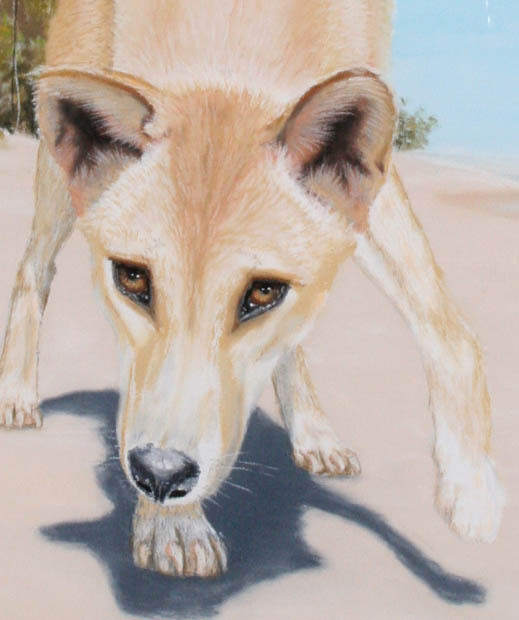 i do hope you see some healthy dingoes, and i also hope that you dont get too sad if you see emaciated dingoes. There do seem to be a few very sick animals on the island at the moment. Paintings are $150 + P&H for 500mmx350mm. The next dingo day wont be until the end of the year, however, we will certainly have some sort of event in the next few months. Have you joined SFID? if you are a member, you will be on the mailing list and will be alerted to whatever events are scheduled. I have read the research about the difference in management between Penguin Island and Fraser Island. thank you for bringing it up. I suspect that you are rihgt – penguins are much cuter than dingoes. How much are your paintings? They are beautiful. i would love to do a portrait of Bingo, thank you. i have two ahead of you – when is your son’s birthday? I would love to purchase a painting for my sons 18th birthday. My son Alex rescued a Dingo x a few months ago that was abused. I wasn’t happy about that at the time but Bingo has melted our hearts. For this reason I would love to give Alex a lasting memory for his 18th birthday. 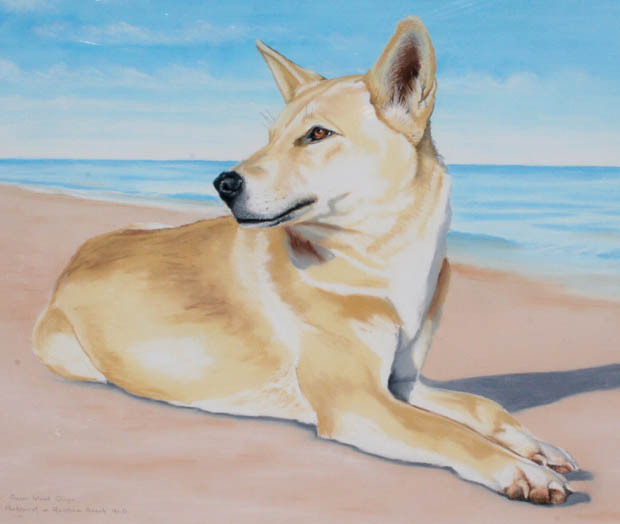 I watched with interest the documentary on the dingoes of Fraser Island, they are indeed a beutiful animal. I dont believe that your interaction in filming the dingoes has led to their behaviour. Perhaps the rangers need to see starving animals and look at the reasons as to why they are starving. And not see pests that need to be culled and if the digoes habitat and food source is being eroded by human interferance perhaps they should think about limiting the amount of visitors to the island and protecting the dingoes from man. On penguin island and seal island in Perth the penguins are a protected species and limited interaction is allowed. Seal island is off limits to visitors. Why is this so is it because they are considered cute! I have only met one dingo in the wild and I did not feel threatened in any, he was very weary of us however. PS: Your paintings are beautiful! Love the one of SRV! 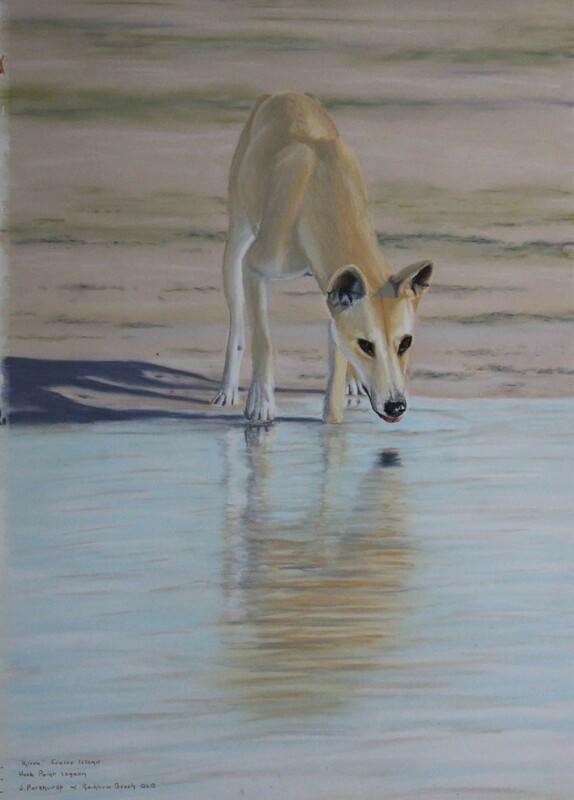 Hi Jen, Just saw your dingo paintings, by golly they are damn good. Hope you sell them. I haven’t seen anything so beautiful. How much are you sell them for. Please let me know. Also, I would like you do a painting for me. If you can please let me know. My heart goes out to you girl, but you’re like me in a way, Dig deep till you get answers. Love you. Just finished waitching Australian Story on ABC. 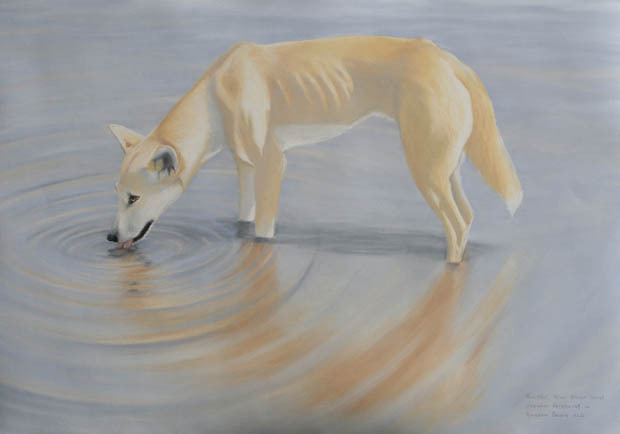 I have to say my heart was really hurting to see what is happening to our beautiful dingoes. My family and I are going to Fraser in about 2 weeks and I am feeling like I am going to be so saddened by what I will see. I was wondering if there will be another ‘Dingo Day’ this year? I would deffinately like to be there to offer my support. 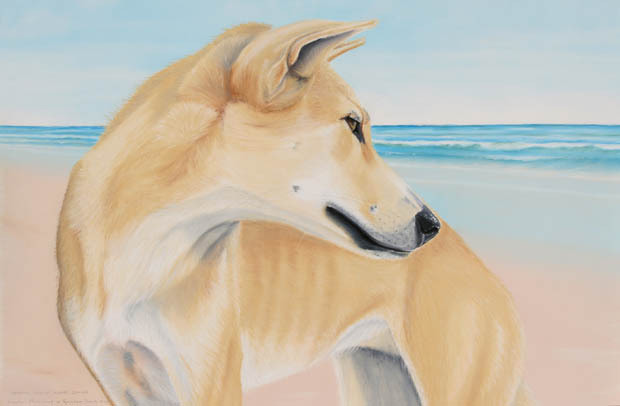 Could you also let me know of prices for your gorgeous dingo paintings and the sizes. Did jaylene ever buy one of your paintings ? How are you? Iv been thinking about you a lot … when is your courtcase. My heart is praying for you.